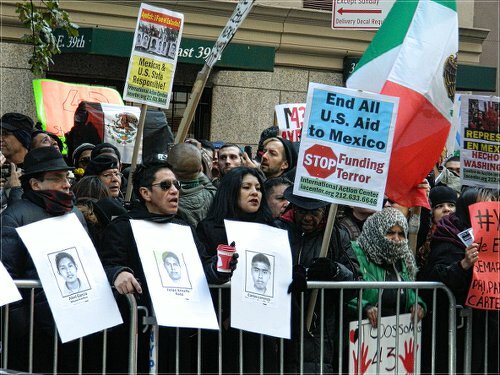 New York saw one of the worldwide protests over killings in Mexico — on the same day as President Obama’s announcement on immigration. President Barack Obama issued a long-awaited Executive Order on immigration policy on Nov. 20. That same day hundreds of thousands of people in Mexico took part in mass marches in solidarity with the 43 missing students from Ayotzinapa in the state of Guerrero. The two events — one in Washington, the other across the border — are very much related. The Obama administration has been completely silent about the Mexican crisis since Sept. 26 when the 43 students were reported missing. Despite the cry of the parents and the entire nation for an explanation of where they are, their bodies have not been found, nor is there a complete explanation of what happened. Reports that the students were found in a mass grave proved false. An independent investigation showed that the bodies were not of the 43. Since then, many mass graves have been found in Guerrero. Students in Mexico have walked off campuses and burned buildings. Unions and communities have marched and marched day after day. On Nov. 20, tens of thousands missed work or school throughout the country. Many call these events the start of the new Mexican Revolution. Surely this momentous development in Mexico must have been in the back of the minds of the political operators in Washington “just a bit” as they planned the immigration announcement. It is too much of a coincidence that an Executive Order on immigration was issued on the same day that Mexico was practically carrying out a general strike. Across the United States, immigrant groups and their advocates gathered together to watch Obama’s news conference that Nov. 20 night, with assemblies as large as 800 people held in union halls and community centers in most cities. This indicated the burning desire and intense longing of undocumented workers for some relief. Every day millions of workers live in absolute terror of deportation. The children of the undocumented go to school each day not knowing if their parents will be home when they return. Tens of thousands of workers cannot report wage theft or abuse at work places for fear of deportation. So the long awaited announcement that something positive may happen in their lives was met with extreme anxiety. And hope, lots of hope. Since 2006, migrants and their advocates have marched, rallied, lobbied and carried out countless actions and tactics. The youth, especially the Dreamers, have carried out militant demonstrations, including voluntarily going into detention centers to organize. For years, however, Congress has refused to move on immigration policy, ignoring the demands from and anger in the streets. Instead, the Democrats bowed to the Republicans, who not only stalled any movement on so-called immigration reform, but carried out an insidious and inflammatory propaganda campaign that resulted in an anti-immigrant, racist hate war. 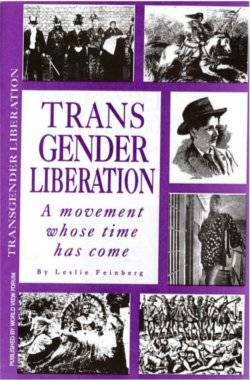 The movement never gave up its struggle. So when President Obama announced that he was going to move on “immigration reform,” the entire movement held its breath in anticipation. “Second, I will make it easier and faster for high-skilled immigrants, graduates, and entrepreneurs to stay and contribute to our economy, as so many business leaders have proposed. “Third, we’ll take steps to deal responsibly with the millions of undocumented immigrants who already live in our country. I want to say more about this third issue, because it generates the most passion and controversy. The president’s plan is expected to affect up to 5 million undocumented workers. According to the Migration Policy Institute, the total undocumented population is about 12 million people. This means that about 7 million workers will continue to be vulnerable for deportation and super-exploitation. A new program of deferrals will be set for approximately 4 million undocumented parents of U.S. citizens or legal permanent residents who have been here for at least five years. Deferrals would include authorization to work and would be granted for three years at a time. The new Executive Order will expand a program created in 2012 called Deferred Action for Childhood Arrivals, or DACA. Young people brought to the country as children may now apply for deportation deferrals and work permits. Some 1.2 million young immigrants are currently eligible, and the new plan would expand eligibility to approximately 300,000 more. An additional 1 million people will have some protection from deportation through other parts of the president’s plan. The immigrant community had a broad range of reactions. Some chanted “Si se pudo” (yes we did); others felt huge relief knowing that they were protected in the coming future. Others realized that they fell under the category of protection while their mothers or fathers still could face deportation — continuing the brutal, tragic breaking up of families. President Obama’s Nov. 20 announcement takes place amidst more deportations than at any other time in U.S. history. Obama was elected on a promise to “fix immigration policy.” Yet he has deported over 2.5 million workers since coming into office. Many call him “Deporter-in-Chief.” Many deportees could have found some reprieve under the current order. The Executive Order continues to benefit the arms industry, which has called for further border enforcement and militarization. The government never addresses the root causes of migration, let alone deals with them. 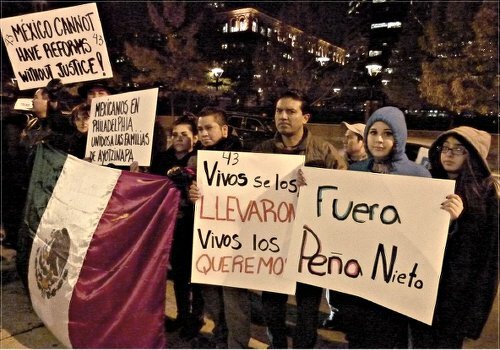 Brutal events in Honduras and Mexico alone — all problems made in Washington — will continue to force workers to leave their homeland, no matter how much the imperialists militarize the border. In addition, Obama announced that his Executive Order could be undone by future presidents or Congress. Republicans responded to Obama’s immigration policy with a total farce. Entrenched in hyperbole, unanimous in inflammatory racist rhetoric, the Republican Party waged an insidious and well-orchestrated campaign against the White House. Some said that Obama’s “amnesty” announcement would bring “violence in the streets” and usher in “anarchy.” Their comments were as reactionary as 1950s rhetoric against Communists or marijuana. “By ignoring the will of the American people, President Obama has cemented his legacy of lawlessness and squandered what little credibility he had left,” said House Speaker John A. Boehner (usnews.com, Nov. 21). The Republicans hint that the government may be shut down again in retaliation. That the Republican Party has waged a racist, anti-immigrant campaign and the Democrats failed to seriously and genuinely defend workers’ interests speaks again to the need to break with both capitalist parties. Both parties are beholden to the system. That system is waging irreconcilable war against the workers and oppressed peoples. No matter that the social base of the Democratic Party includes unions and people of color, while the Republicans’ base is socialites and billionaires, both parties seek to keep the capitalist status quo of low wages, war and police brutality. More and more undocumented workers are deciding that they will stay here no matter what — unless they want to leave. No matter what happens in the White House, the streets of Washington must be filled with the same righteous anger that is now sweeping Mexico.